I made many changes on the original recipe. If you would like to see the origianl recipe, you can get it from Fine Cooking homepage. 1. Combine 1 tbs. salt, 1 tsp pepper, rosemary and garlic paste in a small bowl and rub the mixture all over the pork. 2. Wrap pork tightly with plastic wrap, put it on a small tray and refrigerate overnight up to 2 days. 3. Remove the pork from the refrigerator and let it sit at room temperature for 1 hour before cooking. 4. Position an oven rack in the center of the oven and heat the oven to 300ºF. 5. Move the pork to a roasting pan, uncover the pork, place on the oven rack and roast until tender everywhere except the very center when pierced with a fork (about 3 hours). 6. Combine all vegetables, olive oil, salt and pepper into a mixing bowl. Add vegetable mixture, wine and water to the pan. Cover the meat (do not cover the whole roasting pan - only the meat) with the foil and continue to roast, stirring the vegetables occasionally, until the pork is completely tender (about 45 min - 1 hour more). 7. Remove the roast from the oven and place on a cutting board and cover with foil for 5-10 minutes. 8. Raise the oven temperature to 375ºF. 9. Cut the meat into thick slices and spread the slices out on the roasting pan cut side down. Stir juice onto the meat to baste. 10. Return the pork to the oven and roast for another 5-8 minutes until slightly browned. 11. Remove the pan from the oven and plate the pork slices, along with potatoes, fennel and onions. 12. To make a table sauce for the meat, skim the excess fat from the juices. Put the roasting pan on the stove with medium heat and add white wine. Scrape the pan with the spatula and reduce it until thick. Add butter at the end. 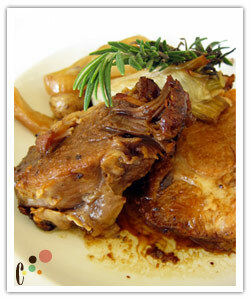 The original recipe is called "Slow-Roasted Pork Shoulder with Carrots, Onions, and Garlic". It calls for a 7-lb pork shoulder but that is not a practical for smaller households. I used a tiny 2.5lb pork roast. I marinated the meat with garlic and rosemary (not just salt and pepper). I added fennel and potatoes into the vegetable mix, and omitted the carrots. I added olive oil, salt, pepper and lemon zest to give more flavor to the vegetables. I decided to cover the meat at the second roasting with foil. Without foil at this stage, the meat gets too dry. The original recipe does not rest the meat before separating (cutting) the pork. It will be more moist if it rests before cutting the meat. The original recipe uses the tongs to separate the pork instead of cutting it with a knife. I tired both ways but I prefer cutting with a knife. The original recipe browns the meat during the last roasting, but it makes the pork too dry. I put the pork back into the oven only until it was warm with very little browning. The original recipe suggests serving the juice without reducing but I found it to be too thin. I added more wine and scraped the pan, reduced the mixture and added butter at the end to make it silky smooth.